The sting of the Toronto Blue Jays elimination loss in the ALCS is still fresh in the minds and hearts of Canadians. In order to take the series with the Kansas City Royals, both talent and luck were going to be required and the only thing lacking was the luck. The Blue Jays’ incredible season and playoff run united the country as is only possible on a few occasions outside of the Olympics. I can’t imagine what it was like to have both the support and the weight of expectation of an entire country on your back. The Jays carried their burden admirably and they did Canada proud. Their playoff run brought back memories of a childhood spent at softball games and my grandparent’s living room, where my Grampy Rushton could always be found in his chair in front of the TV, hollering at a Blue Jays game. I was 13 yrs old when the Jays won their first World Series. I don’t remember many of the details but I do remember the feelings associated with it: the anticipation, the excitement and the elation. It felt like something special had happened. And it had. An entire country rallied behind a team in blue and white, as they captured something that no American probably ever thought they would. And then we did it again the next year. It was an embarrassment of Canadian baseball riches. And then there was not much excitement for many years. Until this Cinderella season. 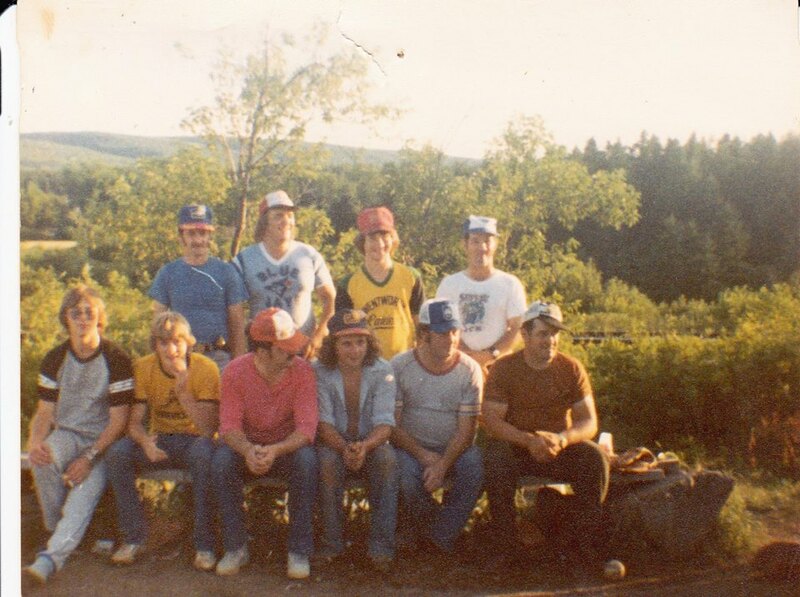 The Jays’ tremendous run reminded me of just how much baseball/softball was a part of my growing up in rural Nova Scotia. An assuming sports broadcaster commented during the Jays series with Texas, that Canadians don’t grow up playing baseball. But they do, Harold Reynolds, they most certainly do. 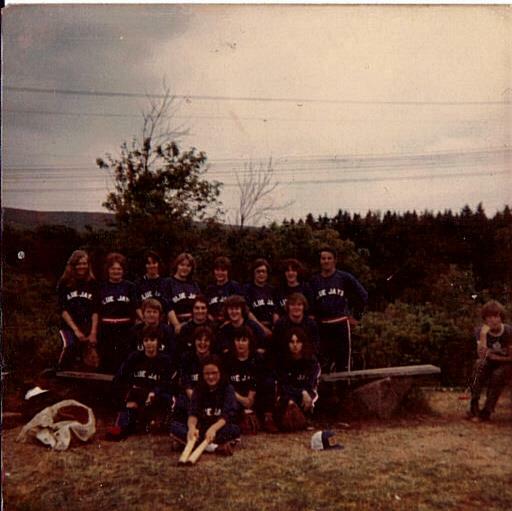 I didn’t belong to a team but I played tee ball when I was small, my parents and most of my Aunts and Uncles were on local fastpitch softball teams and we always played at school on warm spring afternoons. Baseball was a larger part of my childhood than any other organized sport, including hockey. We didn’t have a town rink or soccer field growing up. But we did have a diamond. That fact would probably shock Harold Reynolds. Even in our tiny village, we had our own baseball field, with bleachers and dugouts and the whole bit. So many of my childhood afternoons and muggy summer evenings were spent at that field. I can still smell the dusty earth and fresh cut grass, and see the backs of legs from my hiding spot under the bleachers. The baseball field also served another purpose: that of community gathering place and celebratory space. We had events called Field Days, with parades (in which the softball teams would feature prominently), carnivals with dunk tanks and fake jail and fireworks after dark. They were the kind of celebrations that a kid lives for. And they all revolved around that baseball field. I can imagine it was much the same for small towns across the country. As our town shrunk, so did our ability to maintain the field. It’s a little sad to drive by the field and see it completely overgrown with maples. There are no more bleachers and dugouts and diamonds. No more carnivals or parades or fireworks. There are only our memories. And the Toronto Blue Jays. At least we still have the Jays. And there’s always next year. The following are a few snapshots of our local teams and Field Day events. Thanks to Marsha and Wendy for allowing me use them on the blog! Another kind of Blue Jays. The team walked 20+kms to raise funds for their snazzy uniforms. 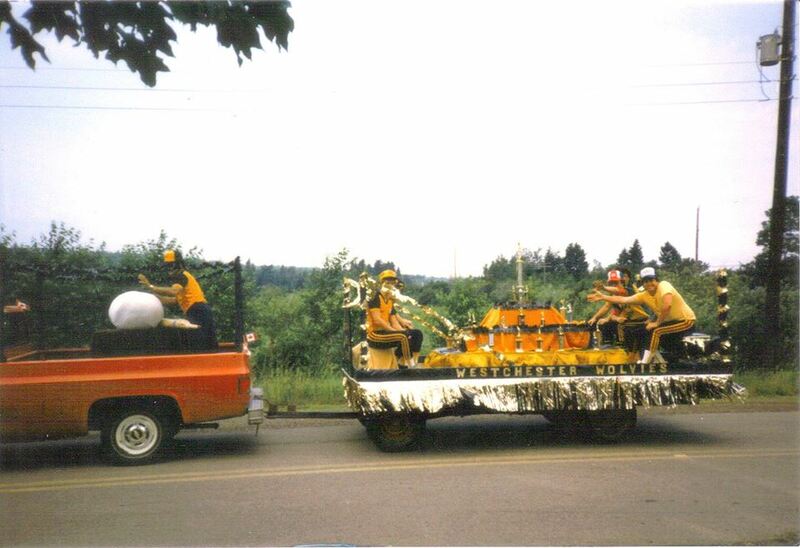 1985 North Shore League Champions, the Westchester Wolvies on their float on Field Day. Webb’s vs Westchester Fire Dept tournament, 1982. 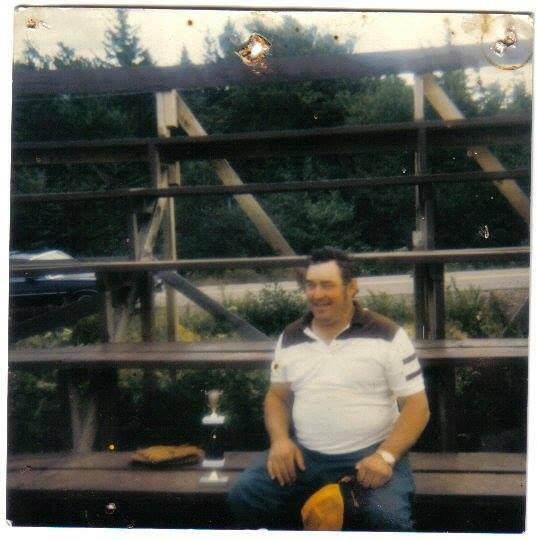 My grandfather Orland Webb sits on the field bleachers with his trophy. Apparently he always pitched in his plaid slippers. 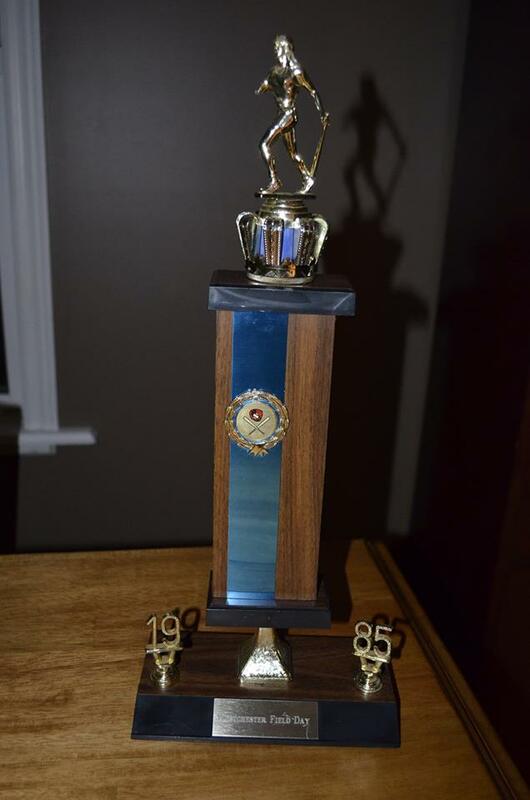 1985 Field Days championship trophy for the Blue Jays! This was the Blue Jays first tournament win. And the tradition goes wayyy back. 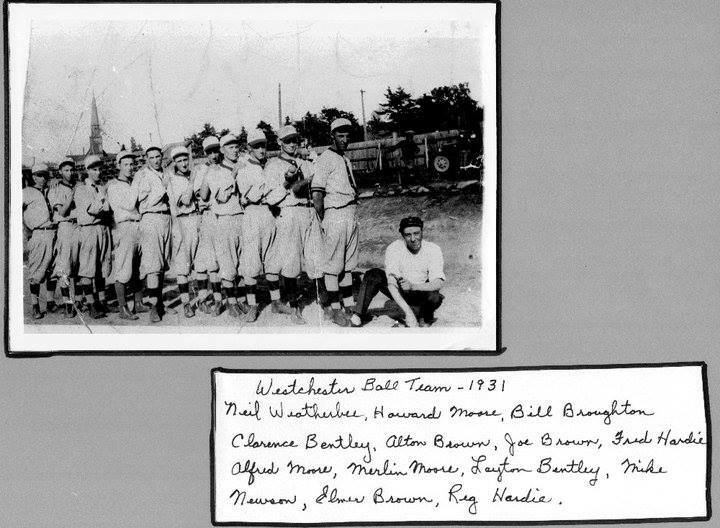 The 1931 Westchester Ball team. Do you have a story of growing up baseball? I’d love to hear it! Melissa, this is a wonderful post. It took me right back to our little ball field in Havelock, NB. Us country kids certainly did grow up with baseball and I can still smell the dust around the diamond, hear the cicadas buzzing on hot summer evenings, feel the roughness of the old bat in my boyhood hands… and I can hear your Grampie Rushton cheering on the Jays. Thank you for this…you are a wonderful writer. Awesome! I knew there had to be more small towns just the same! The Jays certainly brought a nation to their feet…and not to mention my memories of playing as a Blue Jay. Another great story my dear, it warms my heart to hear stories of our little village. I’m not sure if I shared the story of our wedding, you see it was October 1984 and the Wolvies were in the playoffs. The day we were married it had already been decided there would be no honeymoon…Barry had to play ball at noon the following day! Lol – that’s a great story! As usual Melissa another great story! I love them all,I think because we can all pretty well relate to them in one way or another.Thanks for keeping all of our memories alive,I read more of your Maritime Love stories than I do books! Keep up the great work! Thank you so much! I just think our stories are worth telling and I’m glad I can tell them!